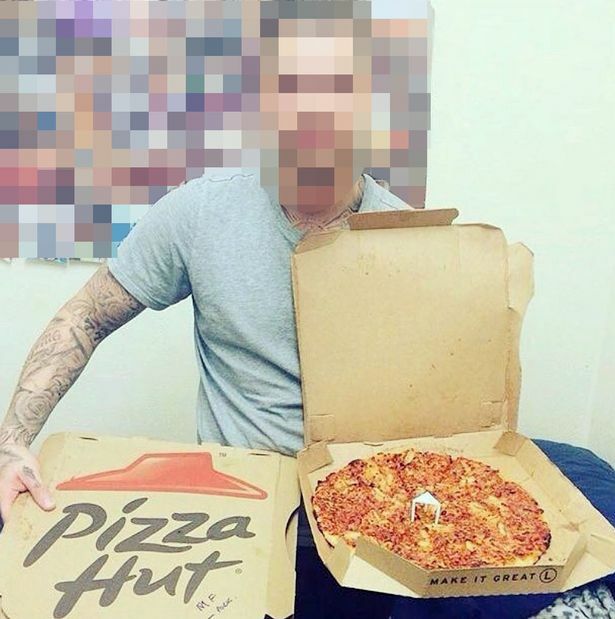 A smirking prisoner brazenly shows off the smuggled trappings of his gang’s cushy life behind bars in a series of shocking images that shame our failing prison system. The swaggering lag and his mates are pictured with a hoard of banned booze, drugs, and an array of takeaway feasts. They also show off a selection of “shopping” goodies including packs of fresh prime cuts of meat many struggling families outside the jail’s walls would struggle to afford. The inmates, with no fear of authority, even snapped some smuggled mobile phones which prisoners are banned from using inside. 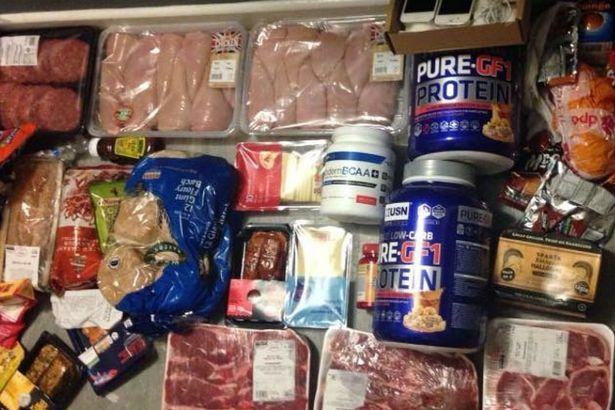 Also pictured were bodybuilding tablets and protein powders craved by inmates who spend their days working out ready for release rather than working on their rehabilitation into society. 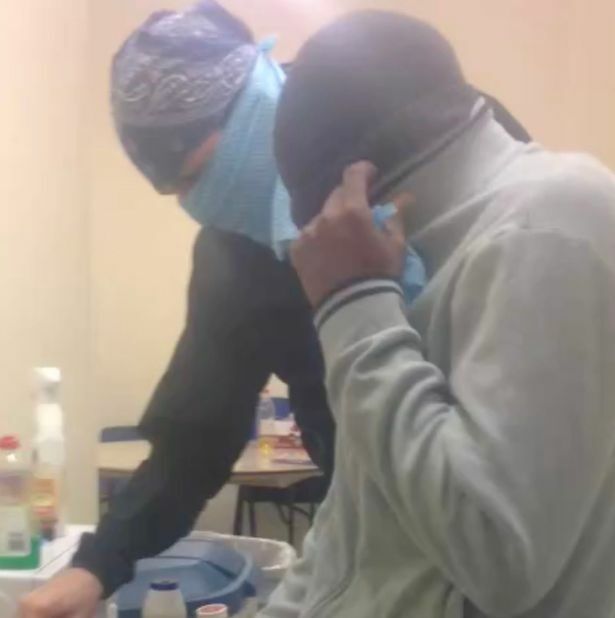 And two of the gang, masked to avoid recognition, are shown cooking steaks on a barbecue themed party night, a change from the usual takeaway dinners smuggled in from Nando’s , Pizza Hut and KFC-style chain Dixie Chicken. 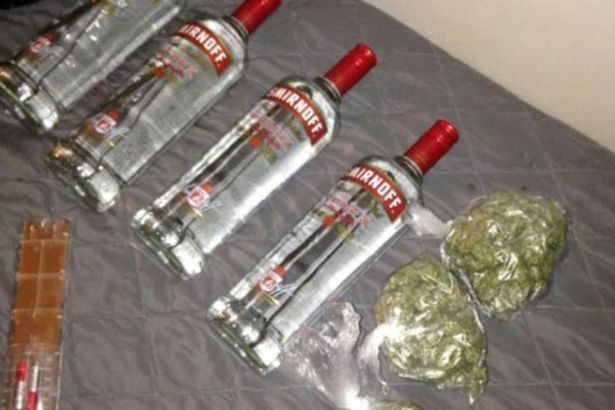 Afterwards there were bottles of vodka to wash it down, and bags of what appears to be cannabis, complete with weighing scales, to add to the entertainment, said to be a karaoke night. The show-offs then sent the snaps out to pals on social media. The images will raise further criticism of the ailing prison system which costs taxpayers at least £40,000 per inmate each year. Levels of violence are up, staff numbers are down and complaints about discipline and overcrowding are widespread. Last night victims’ rights campaigner Harry Fletcher was furious when shown the scandalous pictures. The Sunday Mirror was shown the snaps by a source who was outraged at being sent them. The source said: “I know people talk about going for a cheeky Nando’s – but this really is something else. “These pictures look more like something from a students’ union than a prison. It really is holiday camp stuff. What’s worse is some prison staff are so hard up they can barely afford to take their families for a Nando’s. 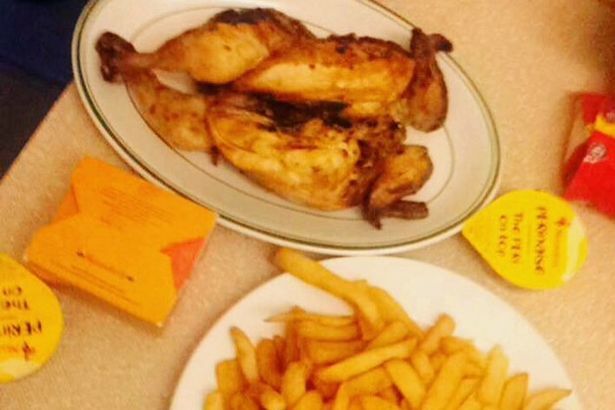 A main Nando’s meal of half a chicken with two sides costs £10.70. Takeaways can be picked up from restaurants or ordered to an address through the mobile phone app Deliveroo. In July last year footage emerged of convict Dominic Usher eating McDonald’s cheeseburgers in jail. Usher, 29, of Nottingham, is serving life for kidnap, blackmail, robbery and arson. 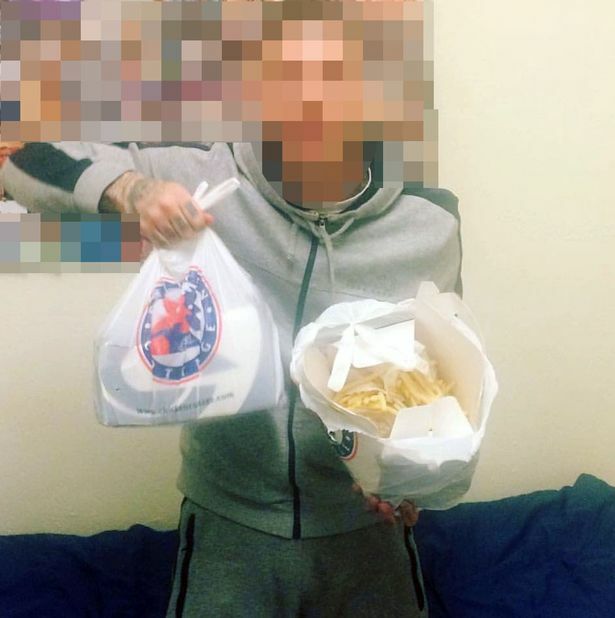 One of the videos shows him turning his nose up at a prison curry before showing off the burgers, while in another he was seen snorting a white powder. Other footage showed groups of lags partying, singing, and even appearing to smoke drugs by using an asthma inhaler as a makeshift bong. There was uproar over the videos but it seems from our pictures that little has been done to stop prisoners smuggling in anything they want. The easiest way for inmates to get contraband is by bribing staff. Some are paid £500 a time to bring in packages, and threatened if they fail to carry out their missions. One source with extensive knowledge of the prison system told the BBC in March there was a working assumption that three to five staff in every jail were corrupt. That equates to around 600 across England and Wales, of a total of 33,000 workers. And prisons have become flooded with drugs. 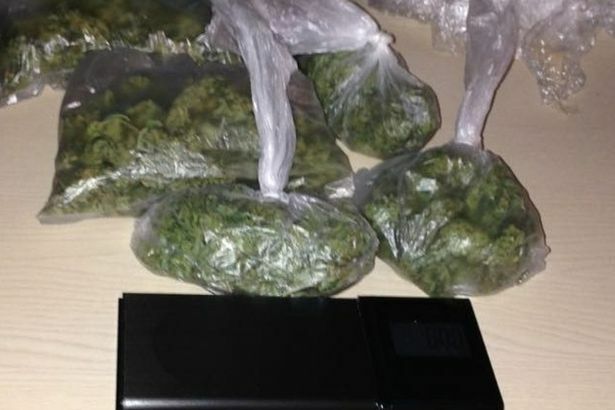 Seizures of Spice – a superstrong synthetic form of cannabis – have rocketed from 136 in 2011 to 4,261 last year, according to government figures. Dozens of videos filmed on illegal mobile phones have been published online showing prisoners suffering the zombie-like effects of the drug. Other footage shows a string of violent incidents including organised fights, initiation attacks and retribution beatings. Rising levels of drug-fuelled violence behind bars have sparked calls for airport-style security in every jail. Peter Clarke, the Chief Inspector of Prisons, told last month how he is being bombarded by complaints from inmates. One prisoner described how the “Spiceheads are out of control” and making life a “nightmare”. Mr Clarke wants to see the scanning of all visitors and staff to stop illicit drugs getting into prisons. Some jails had become “virtually unmanageable”, he said. Drugs are not only being smuggled in by people entering jails – they are also being delivered by drones, or thrown over walls. The Independent Monitoring Board for Britain’s largest Britain, HMP Wandsworth, last month released a highly critical report on security. It found that in one month, sniffer dog searches were conducted on only 10 out of 31 days and there was a shortage of CCTV operators. The damning report said a “severe shortage” of warders was affecting “almost every aspect of prison life”. Resulting problems include ­prisoners being locked in their cells for excessive periods leading to “boredom and frustration” and contributing to high levels of violence. The report said staff shortages were also preventing education and training which was “vital to the process of rehabilitating offenders”. A Prison Service spokesman said: “This behaviour is completely unacceptable. “Those who break prison rules will be punished and can face extra time behind bars.